98% of Amtrak excitement is either budgetary or accident-related. I’d like to focus on the other 2%, which is consist-related. 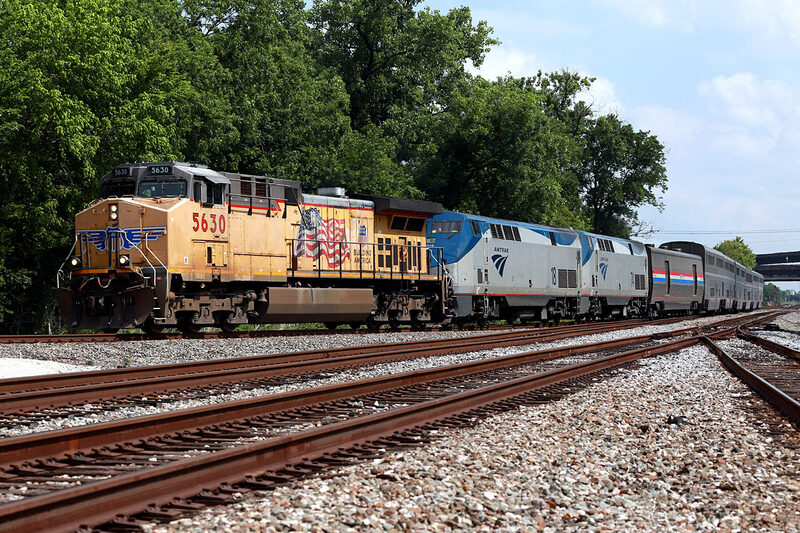 This past Sunday (Is it sacrilegious to railfan on Mother’s Day? A rhetorical question because the deed is done.) 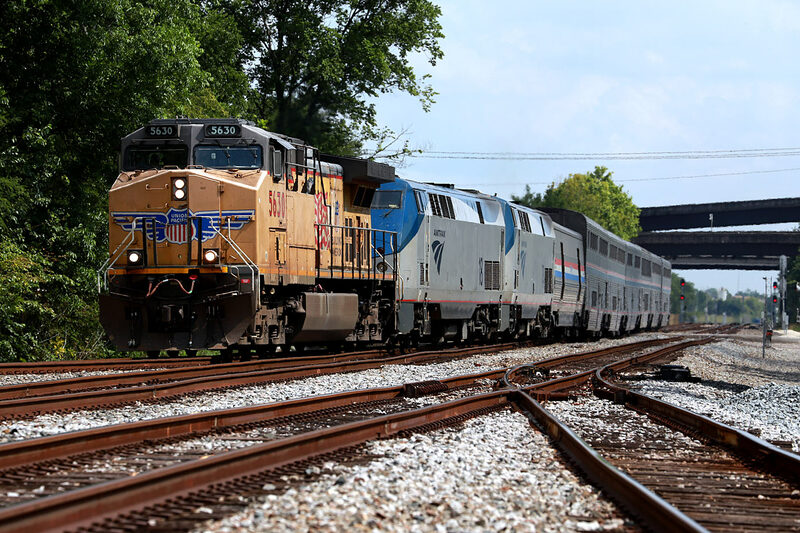 I learned that #2, the eastbound Sunset Limited, was running 3+ hours behind schedule because of locomotive failure. I later received word (Thanks!) that UP was providing a unit at San Antonio, AC4400CW 5630 specifically. The best spot to minimize backlighting on an early afternoon eastbound is in Stafford, between MP 19.75 – MP 21.25. Of course the backlighting became a moot issue because clouds rolled in shortly before the train did. Union Pacific AC4400CW 5630 steps up to help Amtrak train #2 on May 14, 2017 at Stafford, Texas near MP 20.5 of UP’s Glidden sub. Since the train was flying, there was no chance of another shot before the train arrived to the depot downtown. No problem. I’ll just drive 30 miles into town for a second bite of the apple once the train departs. My game plan was to catch it as it was pointed north on the approach to Belt Junction, expecting that this would be the best possible light before the train turned east there. Fortunately, the sun cooperated and I was able to get better shots of what’s actually a rare occurrence, at least in my area, for freight power leading the Sunset Limited. 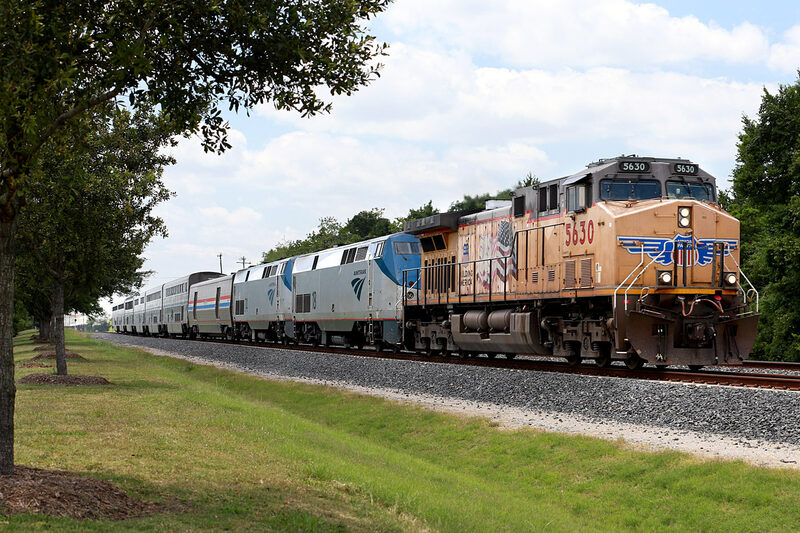 Amtrak’s Eastbound Sunset Limited has just departed Houston, Texas on May 14, 2017 and is approaching Belt Junction where it will diverge from UP’s West Belt sub to the East Belt sub. A more proper US flag on the conductors side of UP 5630 is a bonus as it makes the right turn at Belt Junction at 3:35 PM, over 3 hours later than normal. The Sunset 5-6 car’s only needs 1 locomotive East of San Antonio to New Orleans, if 1 was operational, why the UP locomotive..? You are correct. I have seen #2 with only one unit.The Amtrak lokes were pretty quiet going by me.I suspect one was dead and the second was was less than healthy, but well enough to provide HEP. Great pics. Always nice to see a real pro at work.